A ban on EU arms and military hardware supplies to Russia over the events in Crimea will not become an effective element of pressure on the Kremlin. NATO and the US would stand to lose even more. Following the events in Crimea, the UK and Germany suspended military cooperation with Russia. However, EU sanctions in military-technical cooperation are among the weakest links in the ‘fight’ against Russia. Suffice to say that exports of European armaments make up not more than 1 percent of the total amount of export-import contracts of the Russian state intermediary in arms deals, Rosoboronexport. Russia is the second largest supplier of arms and military hardware in the world. Russian defence industry enterprises have a full production cycle from the element base to the end product. So, in fact, EU sanctions in military-technical cooperation will have no serious effect on Russia's defence capability. Having said that, the 1 percent of contracts do exist. In the case of the UK, those were for the supply of material for military uniforms. As a result of the sanctions, London loses some $133 million. Berlin supplied sniper weapons and was involved in the construction of a combat training digital centre in Mulino (Nizhny Novgorod Region). The amount at stake is $100 million. Yet, Russia's biggest military partner in the EU is France, which for the time being has adopted a wait-and-watch position. 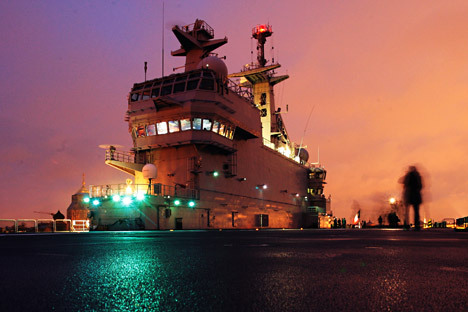 One contract alone, for the supply of two Mistral-class helicopter carriers, should bring over 1.2 billion euros to French companies DCNS and STX (half of that amount Moscow has already paid). In addition, France expected to build two more of these ships in Russia. Who is doing a favour for whom? Yet, the most interesting fact is that the Russian military-industrial complex is all for military sanctions against Russia, especially from France. It is not just because the Russian military does not need French helicopter carriers (neither the Defence Minister, nor the chief of the General Staff have yet been able to explain what these ships were being bought for). If sanctions are introduced, France will have to pay a cancellation penalty big enough to allow Russia to build at least five similar ships in its territory. According to a senior representative of the Russian military-industrial complex, the Mistrals were forced on Russia by the then-Defence Minister, Anatoly Serdyukov. The gossip was that the deal was a ‘gift’ to Nicolas Sarkozy ahead of the presidential election for supporting Moscow in the 2008 conflict in South Ossetia. The French president had to preserve jobs and voters. At the time DCNS was in a crisis, so the contact with Moscow was like a lifeline for the company. Interestingly, Washington has not said a word about military sanctions. The main integrator of the European Union would stand to lose from them far more than its NATO partners. Suffice to recall that the Russian plant VSMPO-AVISMA in the town of Verkhnaya Salda supplies over 40 percent of titanium components for the Boeing 787 Dreamliner. In addition, NATO has a transit base in Ulyanovsk, which handles nearly 60 percent of cargoes for the alliance's troops in Afghanistan. Thus, it would appear that putting too much pressure on Moscow is not at all in Western partners' interests.